Kyle Lawrence of GatherYourParty.com has a great interview with Simon Strange of Sunstone Games. The guys at Sunstone are veteran video game developers that are approaching game development in a novel way. Transparency. Almost every part of their development process is accessible allowing fans to contribute and even view the finances and expenses. One of the biggest projects is Kaiju Combat, a game where you pick the Kaiju you fight with and brawl against another player. The game is driven by the same software engine that powered Godzilla: Destroy All Monsters Melee, Godzilla: Save the Earth, Rampage: Total Destruction, Godzilla: Unleashed, Deadliest Warrior and many more. Read a few excerpt from Kyle's interview with Simon below. What made you decide to make a kaiju fighting franchise? Strange: In general, it was about rejoining the group I worked on Godzilla: Destroy All Monsters Melee with. We got a lot of emails from people saying ‘When are you guys going to make another Godzilla game?’ and then Double Fine came out with their big Kickstarter and we thought. Why not? Our first Kickstarter was in July 2012. We asked for $350,000, and it was a failure. That’s how it was born. Did the decision to make Colossal Kaiju Combat a franchise come before or after the first Kickstarter? Strange: Our initial plan, because we had ties with Toho, was to make a Godzilla game. But we couldn’t actually say it was a Godzilla game. When that fell through we sat down and thought about what we could do with what we had. So we reached out to our backers, and got seven people to each give us $500. In exchange we made a monster for each of them. We then got some server space and started forums to get people talking about what we want to do. It was in these discussions that the game became more about original monsters designed by the community. What we saw from our Kickstarters is that the people who backed us had a monster they wanted in. That’s about 75 percent of our fanbase. So we changed our approach to accommodate more and more of these people. At first I thought, ‘People give $500, that’s great’. But it costs $10,000 to make a character. On our forums, we have a section for people to submit monster designs. Right now we have more than a 1,000 original monsters submitted. It got really overwhelming fast. That’s why we moved into things like the trading cards to highlight these other monsters that might not make it into the game. Building and animation a 3D monster is a huge, long process, and there are other ways we can celebrate and even monetize off these monsters created by the community. 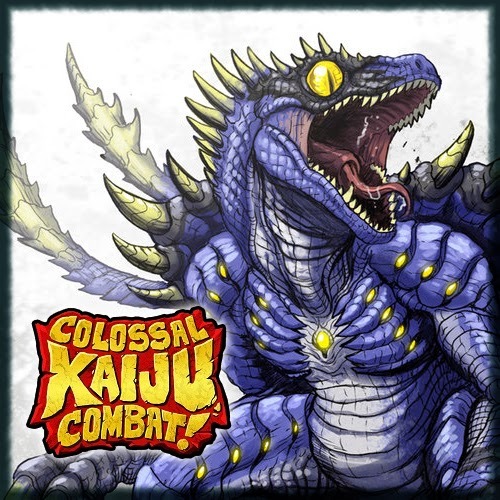 Strange: We have a wiki that’s publicly available [http://kaijucombat.com/wiki/] where we post animation lists, monster designs, everything. We do community design votes. Every few weeks or so we put up something such as with weapon tracking, how much does the AI target for the player, how much is up to the player to do. Things like camera angles, the amount of power a weapon has, is there more emphasis on dodging, using cover. Should shorter monsters be harder to hit than the larger ones. Button layout, HUD design, player select screen design. The thousands of people on the design team [those who have donated at least $5 to the Kickstarter] vote on these things and we implement them into the game. We also have a section for old votes where people can look back at the discussion. Strange: We really need people to donate [to our Kickstarter]. Right now we’re doing an OUYA port. The reason we’re excited about this is because OUYA matches the donations we get through the Free the Games fund [up to $250,000]. So if we raise $45,000 we can make the port, and also have another $45,000 to make a better building destruction system, or add more characters to Fall of Nemesis. One of the difficulties of relying on the community is we haven’t always chosen the cheapest option. Though we’ve made it to have Kaijuland Battles and we’ve made progress on Fall of Nemesis, we’re not in a position to make much more progress with just our initial Kickstarter funds. We’re giving our first game away for free, so the question is how do we keep this going so we can become profitable? There are lots of options, but some take longer than others. If we’re successful not only do we get on OUYA, which opens us to more testers and a wider community, but it keeps production going so we can get to Fall of Nemesis sooner rather than later. I’ve made no personal profit on the game, i haven’t made a dime. I’ve even sunk some of my own money into the project. This is all for the game. Click the following link to go to the Colossal Kaiju Combat Kickstarter page.